DETROIT, Mich., – Early this June, 123Net marked a milestone by surpassing its goal of bringing high-speed fiber to over 600 commercial buildings. The goal was established more than two years ago as 123Net ramped up its focus on connecting Michigan’s enterprises to its fiber optic network. 123Net is not only investing in Michigan’s infrastructure, it’s investing in the state’s talent as well. Its staff has quadrupled in the last five years, now employing over 150 hardworking Michiganders. This includes nine experienced, enterprise-focused construction crews dedicated to building 123Net fiber. At 123Net, fiber design, permitting, construction and provisioning are all performed in-house. Over a dozen Fortune 500 companies and hundreds of large, medium and small businesses trust 123Net to provide them with world-class connectivity delivered via Michigan’s business fiber network. 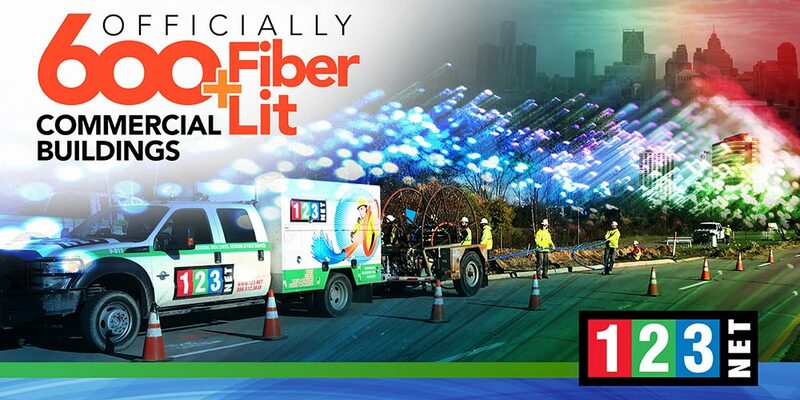 With many more fiber lit buildings on the way, 123Net will continue its focus on providing the best business Internet coverage in Michigan.